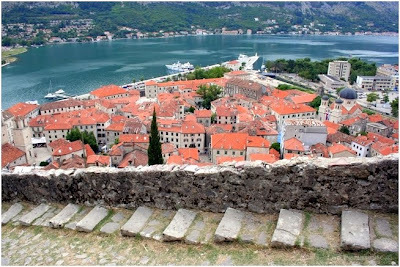 Montenegro is a country in the Balkans situated on the Adriatic Sea, often called “the newest country of the world”. 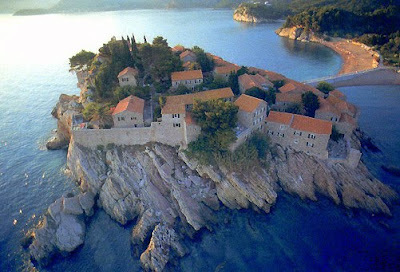 Once a destination for the rich and famous, Montenegro is the hidden jewel of the Adriatic. However with its mild Mediterranean climate, luxurious coastline, beautiful beaches, breathtaking mountains, magnificent glacial lakes, and pristine forests, it is unlikely that this country will remain a secret for long. 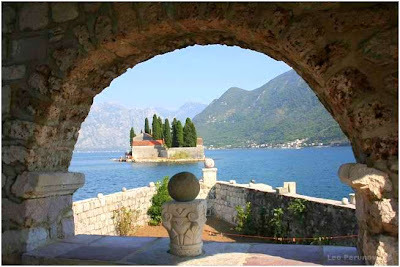 In addition to being famous for its beautiful scenery and natural treasures, Montenegro also has a rich cultural history, which is reflected in its ornate traditions, beautiful architecture and countless marvelously preserved historical sites that serve as portals into ancient times. 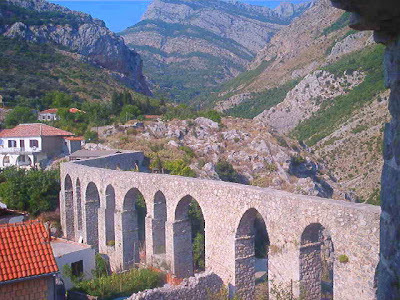 Montenegro is a destination of many interests. Bounded by the clean, crystal clear water of the Adriatic and a backdrop of dark mountains, fields, olive groves or heavily scented pine forests – this is the ideal place to rejuvenate or invigorate in equal measure. Its fertile cultural history offers a perfect backdrop to cultural and historical site seeing, and if an action-full vacation peeks your interest then rafting in the Tara Canyon the largest canyon in Europe, will satisfy your craving for adventure. 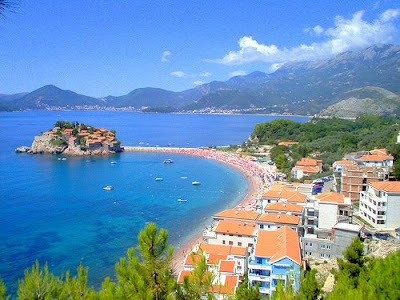 The Riviera of Montenegro offers some of the finest beaches to be found anywhere in the Adriatic. 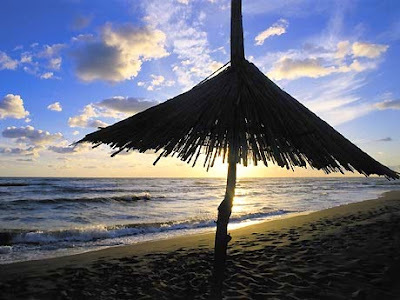 There is vast variety of beaches to suite your mood. You can choose to sunbathe on sand, pebbles or cliffs, man-made or wild beaches with pristine nature. Some of them, pristine and isolated can only be accessed from the sea. The location of Villa Perla allows you to explore all possibilities with ease and fill your vacation with fun and adventure. Once you anchor at Villa Perla you will find that there are so many exciting, mysterious and yet to be discovered jewels of nature in its vicinity. About six kilometers inland lays Stari Bar (Old Bar), completely deserted medieval town first mentioned in the 9th century. After a decade of “lonely existence” the ramparts of old Bar are a cultural center today. Take a little time to visit the studio of the unusual Montenegrin painter Naod Zorica, as well as the studios of the other painters located in the restored stone houses. There are relatively well-preserved remnants of the old towers, streets, and city ramparts, especially the cathedral of St. George and the church of St. Nicolas dating form the 12th and the 14th century. This is also the region of the great olive-growers and olive oil producers. They can pride themselves on having the world’s oldest olive tree that sprouted two millenniums ago! 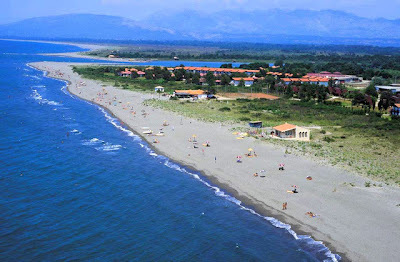 The long sandy beaches will certainly catch your attention when entering Ulcinj. Long Beach (Velika Plaza) is 13 km long and commonly known as Copacabana among the locals. It is covered with the finest sand, said to have medical-healing effect because it is rich in minerals, recommended to individuals suffering from rheumatic problems and other diseases. The main characteristic of this beach is its shallow water. You can sail, surf, water-ski, play beach soccer or volleyball and sport fish with your friends. This natural wonder of sand as fine as flour, rich with salt and iodine, extends as far as the eye can easily see. It is a perfect location where with aid of scenery, sky, climate and waters one can escape from the contemporary demands of life and feel at ease with nature. So much so that, if one is inclined, you can enjoy undisturbed contact with "Mother Nature" by visiting the settlement "Ada Bojana", location of the Europe’s largest nudist colony. Ada Bojana is the artificial river island situated at the very end of the Long Beach, at the place where River Bojana enters Adriatic Sea. After a big storm in 19th century, a ship Merito grounded there. It is considered to be a natural reserve with a face of a national park. The composure of the long sandy beaches will take you away from urban everyday life. Get your body and soul in contact with Mother Nature, whether you are sunbathing, swimming, horse back riding on the beach, windsurfing or taking advantage of various other activities offered. Ada is especially beautiful at twilight - where the amazing display of colors at sunset weaves the sun, sea, sand and sky into a majestic tapestry that melts into evening. 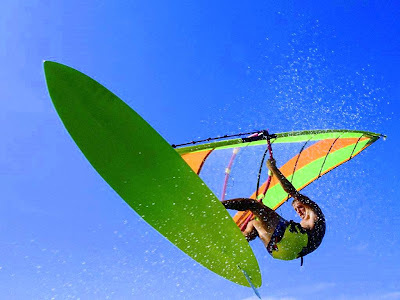 The International Windsurfing School on Ada Bojana has been open since 1975 with the most modern, state of the art equipment for the new millennium. Beginners prefer the flat lake surface to gain their confidence and after a week of training with professional instructors they may feel confident enough to try their skills against the waves of the Adriatic. If it is too hot on Ulcinj’s sand, then you can find shelter in one of the wooden huts on the banks of the river Bojana. You can see the unusual Kalimera, one of the ancient ways of fishing and perhaps taste the fresh fish specialties of the area. There are some of the finest restaurants along the river where you can see fish and fruits of the sea caught and freshly prepared on request in front of your eyes. 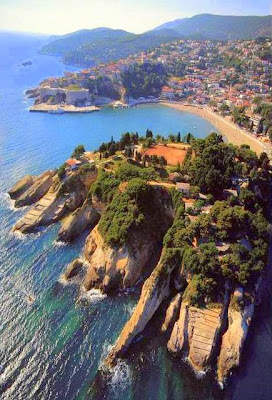 Another amazing treat is the town of Petrovac where if the wind and tides are favorable one can witness the famous "Waterfalls" of Petrovac when a cyclical wave slams into the low-slung harbor wall and sends a vertical sheet of water 10 meters into the air. For those who are scuba- diving fanatics there are two charming islands of Katic and St. Sunday that remain an unforgettable experience for any diver that visits. 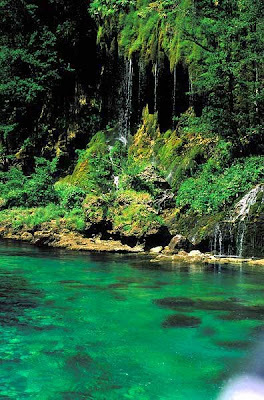 BIOGRADSKA GORA national park is a region of great importance and ecological value. It is one of only three remaining primeval and virgin forests left in Europe. It is essentially a European rain-forest jungle of almost impenetrable trees and vegetation. Many of the most ancient trees are over 500 years old and stretch 40-50m straight up toward the sun. There are 26 plant ecosystems, 86 species of tree and thousands of different varieties of plants. Nature lovers and ornithologists can marvel at the flight of eagles, enjoy the birdsong chorus and observe the breeding habits of 150 different species of bird. This forest is also the home of bears, wolves, deer, and foxes with over 350 kinds of different insects. 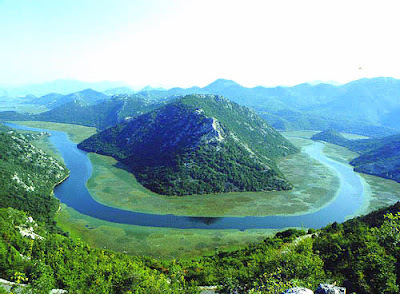 LAKE SKADAR has been formed by the dissolution of limestone in a tectonic basin during the Tertiary or Quarternary period. 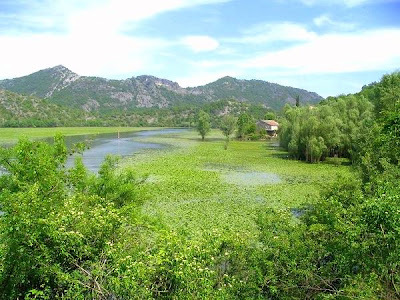 Skadar presents a crypto-depression, which means that parts of its lakebed are actually below sea level. There are around 30 such places called "oke" where submerged groundwater spouts up from the bottom. The deepest "oko" is Radus, which is at least 60m deep and results in rich local fishing grounds. 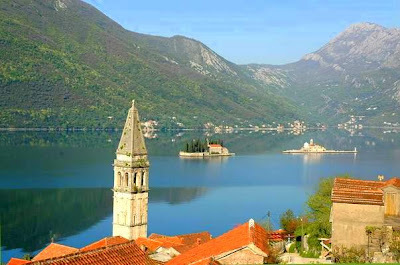 Sixty percent of the lakes area is situated in Montenegro with the remainder in neighboring Albanian. The lake is the last remaining breeding habitat for pelicans in Europe as well as the single largest bird sanctuary in that continent. 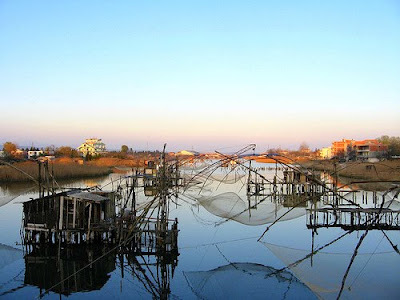 It is one of the last freshwater marshes in the Mediterranean as well as being the largest lake in the Balkans. The Montenegrin element of the lake has been proclaimed national park, and by the Ramsar convention in 1996 Skadar Lake was included into the swamps world list as an important habitat with 270 bird species, many of them rare and endangered. Around 40 fish species are found in the lake and it is interesting that even some saltwater fish can be found here. While cruising along the lake, one is quickly impressed by its jagged coastline with many bays, islands and peninsulas projecting into it. 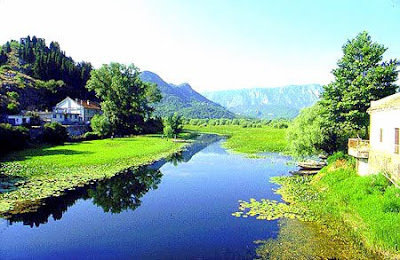 The cultural and historical significance of the islands on Lake Skadar are considerable. Many monasteries, churches and sacral monuments are present here. Further along the lake coast, there is a place known as an ancient metropolis and Montenegrin medieval state, Rijeka Crnojevica where the first book in Cyrillic script was printed. There are also some small restaurants on this island in which local fishermen tempt visitors with their delicious produce. There is nothing quite like the delicate taste of freshly netted carp while enjoying the unique scenery of the island and Lake Skadar. 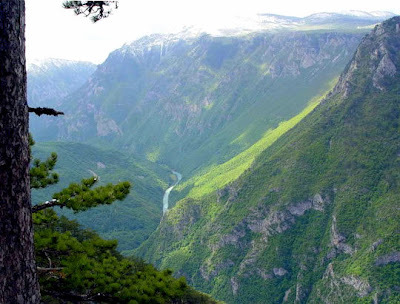 TARA CANYON or "The Tear of Europe” is a great water mass borne of winter snow and seasonal rains. The quality and purity of the water is such that it can be safely consumed by the traveler at any point of its journey through its limestone abyss. The Tara canyon attracts the adventurous sportsman and sportswoman who really enjoy intimate contact with nature. The world's famous amusement parks are a pale imitation of the real excitement and thrills that are unavoidable while navigating the course the Tara River. The Tara has a mean fall of 3.6 meters/kilometer, producing a myriad of beautiful waterfalls and cascades. Many agencies offer rafting in rubber boats. Arrangements can be made for a day, for two days, or even three days of rafting, the length of the passage being from 15 to 85 kilometers. 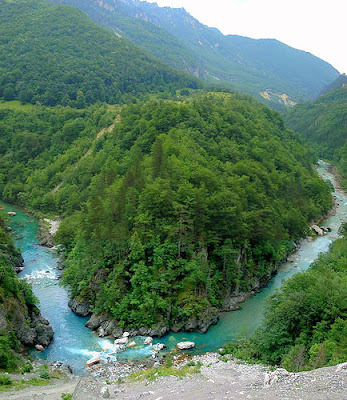 The rafting attractions of Tara have attained Mark 4, very near to the most attractive rafting-rivers in the world. The usual starting point is Splaviste and the one-day rafting excursion is 18 kilometers long and should take 2 - 3 hours. In this section there is the maximum descent height of the river with 21 of the 50 available cascades and rapids on the entire Tara. Even an excursion onto the precipitous slopes of the canyon is an adventure in its own right. The views are as breathtaking as the sheer physical effort to enjoy them. Your views will embrace wonderful, colorful villages, old bridges, monasteries, mills, waterfalls, shepherds and their flocks. 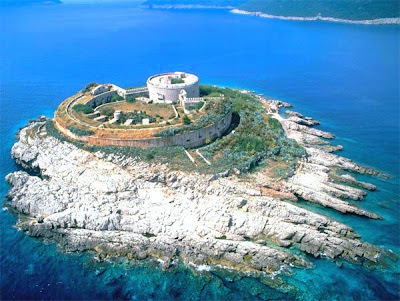 Another fascinating place during your stay at Villa Perla is Kotor Bay (Boka Kotorska). It looks like the mountains have cracked and let the sea in. This is the southernmost fjord in Europe. The high mountains bend over the thin coastline thus protecting it from the severe climate from the north. That is why Boka is an oasis of Mediterranean vegetation: agave, palm, mimosa, oleander, kiwi, pomegranate, and medicinal herbs... When its peaks are covered with snow, the roses bloom at the foothill. There are a lot of remains of the old aristocratic palaces that now bear witness to the ancient splendor and richness. In one of them, the Bujevic’s palace, the Town Museum is located. There are two islets around Perast town – Gospa od Skrpjela (Lady of Skrpljel) and St Gorge, unique tourist attractions. Risan is a famous for the remnants of the classical culture. Here you can also find the remains of a Roman Patrician’s villa with mosaic floors as beautiful as those made in Roman period. HERCEG NOVI is a town situated at the end of the bay. The town is a fine combination of romantic, Byzantine and oriental styles inter-weaved in the Mediterranean appearance. Today, Herceg Novi is the town of flowers with all its windows faced toward the sun and the sea. 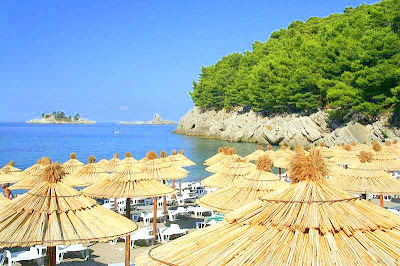 It is one of the warmest towns at the Adriatic coast. One should visit the City Museum and the Archives, the Modern Arts Gallery, the Old town with Tower clock. 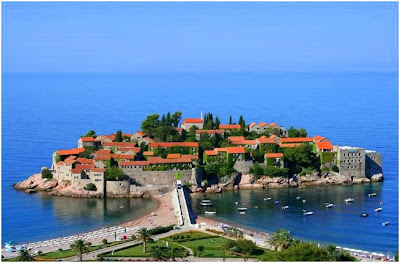 Just a short drive away from Villa Perla is the well-known Sveti Stefan situated in the middle part of the Budva Riviera by a narrow, sandy isthmus. 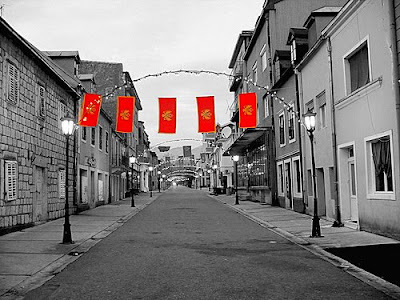 A former fishing village, fortified to protect its people against pirates, it has become the symbol of Montenegro and its Mecca of tourism. Since the 1960's it has been endorsed as a world famous resort for the international jet setters. This warren of stone paths, stairways, tunnels and tiny gardens is one of the most secluded and beautiful hideaways in an already secret place. It is a favorite destination of royalty and celebrity alike. Advocates include Princess Margaret, Christine of the Netherlands, former Italian King Umberto II of Savoy, Sophia Loren, Kirk Douglas and Claudia Schiffer etc. We hope that the above attractions pointers give you a basic idea of what awaits you upon arrival to this magical place. Enjoy your Stay at Villa Perla!